There’s certainly no shortage of apps that claim to boost your brainpower by having you pop numbered balloons in ascending order or drop blocks into obligingly shaped gaps. But does practicing such games translate into aptitude at real-world tasks? That question has long been debated (often between scientists and the developers of the games). A recent, large-scale study found that, in healthy young adults, brain-training games do not improve cognitive ability except in areas involving in playing the game. However, other studies have found improved reasoning and problem-solving skills in over-50 adults who played brain-training games. There’s also some evidence that a specific type of brain-training exercise called the dual N-back, which involves increasingly gruelling rounds of shape-matching, improves overall cognition: specifically, fluid intelligence (the brain’s overall capacity for learning new things and problem-solving) and working memory (the ability to juggle information, used in tasks ranging from recipe-following to navigating). In dual N-back, players watch a row of incoming shapes. In round one, they tap a shape if it is the same as the one previous; by round three, they must tap a shape if it’s the same as the shape three previous. Some brain-training apps include versions of the dual n-back. Certain real-world tasks do benefit from simple practice – arithmetic (for bill calculation, say) or improving spoken vocabulary. And some brain-training apps are now incorporating such exercises. The challenge of playing a new game could also help sharpen mental acuity – learning and other mental stimulation has been shown to stave off cognitive decline. 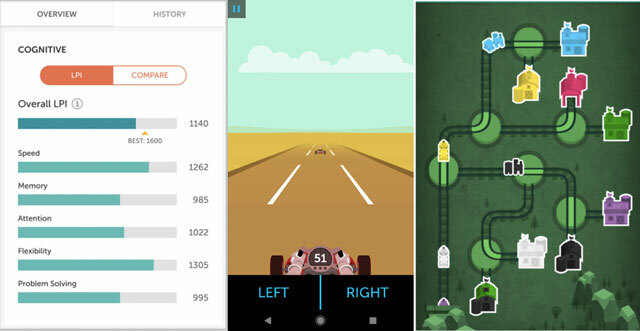 In choosing our favorite brain-training apps, we looked at the variety and challenge of games included, the applicability to everyday life, as well any research into the brain benefits (coupled with the necessary pinch of salt). Still one of our favorites, Elevate incorporates a huge range of games underpinned by real-world applications, in five streams that hark back to schooldays learning: Listening, Writing, Reading, Speaking, and Math. Each of these spans intriguingly named skills such as Brevity or Eloquence. In one exercise, you’re asked to type in the best synonyms, rather than choosing from a list, which can be helpful for those struggling with that word on the tip of the tongue. Highly practical exercises include sum estimation (handy for those bill calculations), tests of common spelling and grammar errors, and, uniquely, audio passages whose details you’re quizzed on (I have quite abysmal listening skills, it turns out). Exercises become harder the more you play, with the option to unlock “Study Materials” for skills such as public speaking after finishing five daily training sessions. Pro users get unlimited access to games, unlimited plays and more analysis on their performance. 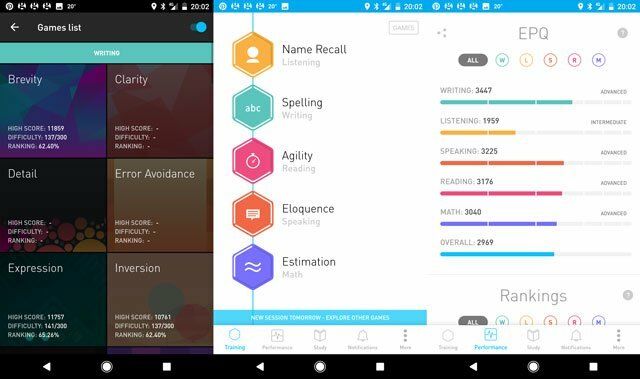 The research: Elevate users tested 69% better than nonusers on questions in grammar, writing, listening, and math (devised by an independent research company), the key practical skills designed to be trained by the app. 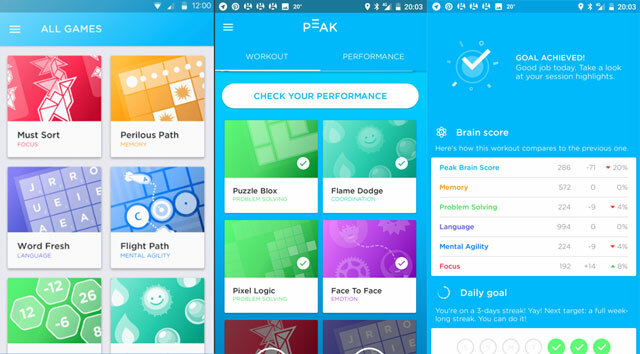 Instead of academic areas, Peak focuses on specific cognitive skills such as memory, mental agility, problem-solving, focus and language (that is, ability to communicate). Games tend to be more visual than Elevate, including a Sudoku-esque visual puzzle and number popping in numerical order. One of the highlights of Peak is the visual display of your performance as a constellation of all cognitive skills so you can instantly see your top skills. Along with full access to games and insights, Pro-users can additionally compare their particular constellation to others in other age groups and professions. The research: The premium-only Advanced Training Program is a memory game called Wizard, created in conjunction with scientists or institutions including Cambridge University, based on research that demonstrated its benefits for visual and episodic learning, and new learning. Lumosity has backed away from its claim that playing Lumosity sharpens mental acuity in everyday life, but its team of neuroscientists, psychologists and game developers are still turning out quick, beautifully designed exercises. These are intended to work cognitive skills such as information processing, spatial orientation and working memory, in surprisingly fun mini-games such as reorganizing a train track on the fly to get carriages home to the right station. The app also recently added a Mindfulness category comprising led meditation sessions for focusing breath and attention, ranging from one minute to several minutes long. As with its fellow brain-training apps, the paid-for version unlocks the vast majority of games as well as access to analysis on your cognitive skills. The research: A study of 4,700 participants found that the half who played Lumosity performed better at a general cognition test than the half who did crossword puzzles. The pinch of salt: The link between test performance and everyday smarts is still to be defined. Long before brain-training became a billion-dollar app market, this addictive classic was worming its way into our minds and Gameboys. 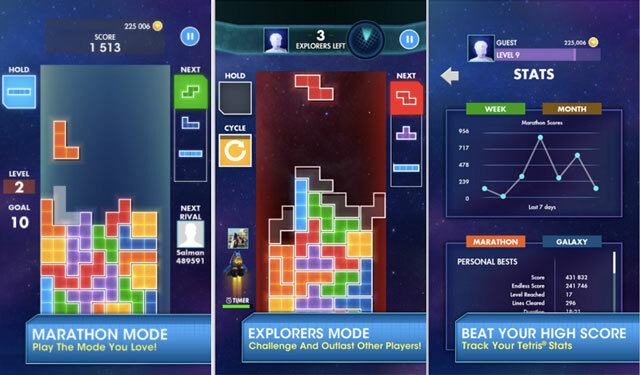 One study found that over 60% of participants dreamt about the falling Tetris blocks, suggesting the brain was working in sleep to make sense of the game. The gameplay of rotating various shaped blocks to fit into your existing rows is an elegant test of spatial intelligence – the ability to visualize the orientation of objects in space. The current version for iOS and Android adds a couple of new modes, including for competing against other players, plus a personal bests tracker to relive past glories. The research: Adolescent girls who played Tetris were found to have a thickened cerebral cortex, with brain efficiency possibly increased. Recent studies also found that playing Tetris can reduce addictive cravings and block painful memories in PTSD sufferers. The jury is still out on the real-world benefits of brain-training – though interestingly, brain-training appears to raise IQ points for those who believe it does. However you choose to exercise your gray matter – with language-learning, crossword solving, or a brain-training app - make sure you keep challenging yourself with tougher puzzles. Any benefit of a brain exercise come only while the exercise is still difficult. I LOVE Luminosity! I had dappled with their free account for about 6 months last year which gave me limited access. Had an “ah hah” moment when I realized that there is a family history of mental illness on my father side & dementia on my mother side. At 56, I stopped dappling, & made it part of my daily routine. I have seen a difference in memory, focus & concentration. Last month I took advantage of a 30% off special & took out a family membership. Now my son ( recently diagnosed with schizophrenia), my grown daughter (new college student @ 30 something)& 2 oldest grandchild ( ages 15 & 11) all play brain games. Can Brain Workshop work on Win 7? The Brain Workshop page says it will work on XP and Vista. Says nothing about Win7. Has anyone tried Brain Workshop on win7? I do not have the money for Luminosity or FitBrain but I sure don’t want to mess up my computer downloading it if BrainWorkshop doesn’t work right using win7. Thanks for any help! Sorry for the slow response. It does work on Win7 and Win8. I just installed the program and tried it. So the expert says these games are pretty much useless yet the article goes on to advertise them with their top pick of course being the most expensive. I have to agree with the expert, these games are useless. If you really want to exercise your brain, put that stupid game down, get off of the couch, and go live life. Dr. Fotuhi doesn’t say brain training games are useless. Number two on his list of things you can do to improve your brain’s health is memory exercises, which the best brain training games can provide. My favorite brain game is Brainwell. It is the most interesting, cheapest, and best made app out there. You guys should check it out. Yeah, it’s really simple and is free of cost, it’s in app purchase aren’t also expensive like others. The look, the feel, everything is great. Lumosity is the second recommendation on our list. It’s the game which trains multitasking, attention, mental endurance, memory and calculations. You should watch the several flows or food and open and close the mouths to eat the exact quantity of food bits. Right now I’m gathering stats to improve my game. My students in Air Traffic Control managed to reach the top score of almost 300 in hard mode. The research shows that these brain training exercises only improve the narrow task exercised. So, if you want to find the duck faster, keep doing that exercise. If you need to get better at mental math, do mental math exercises or Sudoku. These exercised DO NOT change the progression of Alzheimer’s or such. Read, get outside, engage in life, do things you enjoy, be with nice people, eat healthy, get good sleep. These will all do more for your brain than any brain training exercise. Have you tried Monkey Bubbles, not for the whole brain thoguh, but really useful for keeping memory functions up and having fun at the same time. Monkey Bubbles may help people learn how to focus as an improved skill but it does not improve short term memory, a brain function, not a skill. Short term memory is a electro-chemical process. They have yet to find a way to correct this when it is malfunctioning. Proper nutrition, proper sleep (most important),and avoiding bad chemistry (drugs, etc) will help more. Of course it cannot help by itself since the treatment includes electro-chemical process as well as you mentioned, it can be just an additional factor to help, and this was what I meant. No, it does not help. Saying Monkey Bubbles helps with short term memory is like saying I can satisfy my hunger by looking at food. Just because you can increase your score does not mean you have improved your short term memory. Almost every improvement seen in brain training is due to learning how to do the specific task. The only true change is when the exercise promotes an increase in reaction and processing speed. Monkey Bubbles may be entertaining and provide an opportunity to get better at Monkey Bubbles but if you change to a different exercise, you will be starting over on the brain training learning curve. These are just attempts to make some money off a gullible public who do not understand the limits of brain training. Getting good exercise can be just as beneficial. play dual n-back, it is scientifically proven that it gives a boost to your IQ and to your mental intelligence. Dual n-back is flawed science. If not flawed, it is at the least over stated. Read the study. Dual n-back is a skills improvement program. They specifically say that is trains a skill set that is testable by an existing intelligence test for fluid intelligence but uses different but similar tasks. The skill learned is focus and a form of dual tasking. Improvement in focus is primary to dual tasking. This shows up in improvements in digit span. Many newly learned skills can be applied to different tasks that utilize similar skills. The simplest concept is learning to juggle. This crosses over to other eye to hand coordination tasks. I can train someone to be more observant, especially during the younger years. This can be used in many arenas. I can even train the persons to have faster observation skills. This will show up in some intelligence tests. But, is this an increase in intelligence or a decrease in visual laziness ? I say the latter. Again, brain training is skills development, not intelligence improvement. Elevate is fun and has me considering buying a pro membership, Lumosity is a joke. The fact the Lumosity app has not been optimized for the newest iPhone screen sizes tells you all you need to know. Consider this, Lumosity is charging $12 a month for their pro version yet they haven’t even optimized their app for the newest iPhone screen sizes. The iPhone 6 and 6 Plus came out in 2014 and yet we’re in the 2017. If a company isn’t gonna improve their app, it shows it’s a cash grab. If you don’t believe me look at the keyboard of Lumosity on iPhone 7 Plus and compare it to the keyboard of Elevate. Elevate is optimized, Lumosity isn’t. When Lumosity invests money in optimizing their app I will re-evalute it. But chances are they won’t until Apple makes it a requirement. This sounds like a troll endorsement. If you find it entertaining and buy it for its entertainment value, there is no reason to not subscribe. But don’t expect it to improve your brain functions. i’m fighting myalgic encephalomyelitis, an illness that has a neurological component and was therefore watching the relentless progressive deterioration of my skills –and very much noticing it. as i cannot indulge in any of the ‘normal’ ways of giving your brain a workout, like going for a walk, exercising or anything else that tires me out, for that just worsens it all, i turned to brain training apps so as to not just do nothing. so i’m using the apps just wanting to mantain what i have or hopefully get back some of what i’ve always had and not necessarily to improve beyond that point. i’ve tried several apps and with time i’ve focused on lumosity, peak and elevate. as i haven’t been able to work for over two years, i am limited to just the no-pay versions, so it won’t come as a surprise that i no longer use lumosity, for it’s lack of variety becomes just annoying with time. i’m not seeing much anymore of peak either, for i cannot cope anymore with the violence implicit in some of its games; it just turns me down. i understand very well that most people today don’t consider the daily coping with violence to be a bad thing, but i’d guess that violence truly doesn’t prepare you for violence, it just harms you further. so that leaves elevate. in broad terms, i am contented with it, do my daily workout and look at my statistics. i love to be able to do my exercising in way less than half an hour each day and mostly enjoy it very much. to have to do it at a speedy pace used to cause me lots of anxiety but i’m past that point by now. what i truly miss in elevate is some kind of logical exercise that makes you think out of the box, for that seems to widen your capacity of understanding. i would wish as well for a less steep progression that allows you to truly get what they offer at a certain level before moving on. a knob allowing to set the rate would be a great addition. daily i do as well some sudokus and read (and rapidly forget most of it). summing up, i’d say that none of these games will be able to give you what you haven’t got, so don’t go for false hopes, but they may certainly help you not to lose it any further or not as fast as may be usual with aging or stress alzheimer’s or such a large variety of illnesses. I also play minesweeper, freecell, spider solitaire, and others that require cognitive processing. The goal is maintaining good blood flow so you do not need these over-priced and over-hyped brain training games. i’ll give it a try. i very much appreciate your answer. Those naysayers for the dual n-back method, you see them pop up everywhere. I would almost think they are getting paid to make their statement, or they are just very negative people. I see them y brag about that they can do 9-back or even higher and then they say they thill have a bad memory. You have to give your brain a challenging task and there are studies that prove the workings of n-back together with so many positive testimonials for so many years. Though I doubt if all the n-back software/apps out there have a good randomizer, because with some of them I clearly saw the same patterns repeating which is no good for working memory and Gf improvement. These applications all teach narrow skills. The actual broad improvement levels are minuscule compared to the narrow skill improvements. Some of the skills have cross-over to other skills. The mind is amazing at how it can develop skills and protocols for maximizing success with a task.Learning better focusing skills and developing indexing of images improves the processing of those images. Most people have lazy minds. With a bit of practice, these lazy skills can be greatly improved. N-back and other like it do that. Ii would like to ask your advice & suggestions for what might be a good game or computer game for an 84 year old dementia patient who has short term memory loss from TIA’s, stroke and from having a brain tumor (removed now) pushing on the brain! This is a brilliant man who needs more to do than watching mindless tv. He reads but reread a lot with out realizing he has already read the pages/book! It is unlikely that anything can be done to regain his short term memory skills. They are just gone. If he can reread without remembering he has already read the book, there is nothing wrong with that. He will likely need to reread a book 3 or 4 times before he remembers what he has read. I can watch rerun movies and TV series each year. I remember little bits but still enjoy the whole program. His sleep quality can make a big difference in his recall. If he is not getting deep sleep, anything that can improve that will help. Most his age will struggle to keep a sleep routine. My father was a rocket engineer, he spent his last few years not able to make sense of his past. We had to introduce ourselves to him each time we came into the room for his last year or two. I do jig saw puzzles online. If you can find things he enjoys, be grateful. I can’t read fiction because i can’t remember the characters. You may miss that part of him but try to not let him know. If he remembers wrong, that is OK. I know it is hard but be gracious as he continues to decline. I’ve lived with memory issues for 20 years. I do fine until somebody challenges my struggles. Thanks for the speedy reply. Yes, he seems to sleep well and enjoys what he reads. The TV he watches is the local news channel that repeats itself (like CNN does) all day long. I believe that the background music and tones are comforting as is classical music. He also enjoys watching the golf channel and football, but rarely knows what the score is or who is playing. A former addicted runner/athlete, he’s happy to just sit in his recliner all day now. Both of my parents were dementia patients: my father a definite Alzheimers’ victim and my mother possibly vascular dementia, so I’m cognizant of the possible pleasures. I’m always searching for ideas, however. As he won’t exercise at all now, I’m making him go places to have dinner or to do something that requires more walking. And because of my possible genetic future, I’m trying to keep mentally healthy too! Thanks for all your input on this site. You seem very knowledgeable! Ontimepunch a online rewarding puzzle game. Ontimepunch is a money grabbing app designed to take your dollars and give you a small reward in return. The 5-cell is an analog of the tetrahedron. Tesseract is a four-dimensional hypercube - an analog of a cube. The 16-cell is an analog of the octahedron. The 24-cell is one of the regular polytope. The hypersphere is an analog of the sphere. The article shows pricing for a lifetime subscription of $149. Is this offer valid? I do not see this offer anywhere in Elevate Pro. When you’re paying for subscription, they show you the price per month. So, when I was paying, I was sure I’m paying for one month subscription (and I wanted just one month subscription), but they charged me for a whole year! So, I paid 12 times more for something that I didn’t want to have (I mean I didn’t want a full-year subscription). When I declared this problem and asked for a refund, the just told me to ask for it from Apple (as I paid via iTunes), and Apple said I’m not entitled for the refund! And, Peak just ignored my further requests transferring them to “closed” category. They as well eddited my comment about this situation that I placed in AppStore. So, all this is a fraudulent way of doing business! It’s a good tool though The content should be revised. I found several mistakes ex: go hike does not exist. Please revise it.